The Oakville Chamber Orchestra presented a program in E flat Major preceded by a lecture from conductor Charles Demuynck about the significance of E flat. He is a passionate and engaging teacher and it is no wonder this orchestra has blossomed under his direction. They are a group of very talented and dedicated volunteers. The evening began with Piano Concerto #22 by Wolfgang Amadeus Mozart played by Stephanie Cheng who is currently Assistant Professor of Music at the American University of Kuwait. This Concerto marks the first time Mozart included clarinets in an orchestra and he had them shadowing the piano especially in the first movement Allegro. The andante second movement began slowly and mournfully until the wind section came in and gave it majesty, Cheng played it with power and authority. The rollicking Rondo had a solemn minuet in the middle, then seamlessly back to the original Rondo – the most familiar movement of the piece. 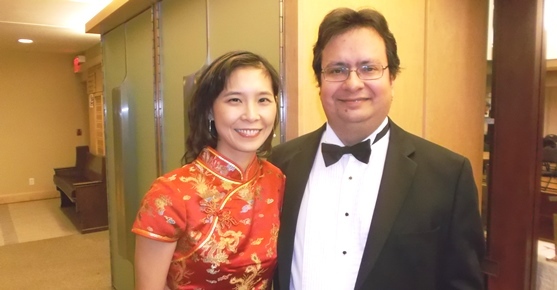 Cheng had flown in from Kuwait and showing no signs of jet lag, was wearing a lovely red Cheongsam for luck in the New Year – the Year of the Goat just begun. At intermission the audience was invited to the church hall to view works by the Marquetry Society of Canada. One of these was a gift box with the ‘ribbon’ and ‘bows’ all made of wood, it was quite extraordinary. The standard of the works on exhibition was amazing and showed both precision and creativity. There were also some lovely wood and soapstone sculptures on display. It is charming to have a mix of arts available for us to enjoy. It was a shame that fewer than usual attended because of the snow. The evening wrapped up with Symphony #3 (Rhenish) by Robert Schumann. Maestro Demuynck said it was close to his heart as it represented an area of Germany which has become a second home to him. The work is in five movements and is a celebration of the landscape, legends, and history of the Rhineland. From the grand, confident, very Germanic Lebhaft; to the familiar floating Scherzo; the quiet and lovely Nicht schnell; on to the thoughtful very confident Feierlich; and finally back to Lebhaft ‘to be played in the manner of an accompaniment to a solemn ceremony’ according to Schumann. The final movement is meant to invoke the grandeur of the Cologne Cathedral and is majestic and complex. Timing is extremely important here and this orchestra met the challenge well. For future concerts by the Oakville Chamber Orchestra and information on an exciting upcoming fund raiser please visit their web site.